Television (TV) watching is the most common leisure activity in the United States. Few studies of adults have described the relationship between TV and health behaviors such as physical activity, diet, and body weight status. Extant data from the Atherosclerosis Risk in Communities (ARIC) Study were analyzed to assess the association of TV with physical activity, diet, and body mass index (BMI) among 15,574 adults at baseline (1986–89) and 12,678 adults six years later. Television, physical activity, and diet were collected with questionnaires and BMI was measured at both time points. Based on baseline TV exposure, adults were categorized into high, medium, and low TV exposure. Linear and logistic regression models were adjusted for gender, age, race-center, smoking, education, and general health. Relative to participants who had low TV exposure, those with high TV exposure were more likely to be less physically active and have a poorer dietary profile at baseline and six-years later. Participants with high TV exposure at baseline had a 40% and 31% greater odds of being considered insufficiently active at baseline (1.40, 95% CI 1.26, 1.55), and six years later (1.31, 95% CI 1.18, 1.46). At baseline, high TV exposure was also associated with a 20% to 30% greater odds of being above the median for servings of salty snacks (1.37, 95% CI 1.24, 1.51), sweets (1.26, 95% CI 1.15, 1.38), and sweetened drinks (1.29, 95% CI 1.17, 1.42), and below the median for fruit and vegetable servings (1.36, 95% CI 1.24, 1.50). Higher TV exposure was also cross-sectionally associated with a greater odds for being overweight or obese (1.43, 95% CI 1.29, 1.58). Similar associations were observed between baseline TV exposure and six-year physical activity and diet, but were not observed with BMI after six years follow-up. These results support the hypothesis that time spent watching TV is associated with deleterious effects on physical activity, diet, and BMI. Over the last half century, television (TV) has become the most popular leisure activity in the United States [1, 2]. American adults watch an average of four to five hours of television each day . The increase in the number of televisions per person and hours of television watching in the United States has paralleled the increase in obesity during the last fifty years [4, 5]. Despite the prevalence of this sedentary behavior, there has been little research in adults that describes the relationships between television watching and physical activity, diet, and obesity. The sparse research on television with physical activity or diet has produced mixed results. The studies on television and physical activity have primarily been cross-sectional and the reported associations have been low (unadjusted correlations, -0.03 to -0.11) [4, 6–10]. The studies on diet and television have also primarily been cross-sectional in nature, but have shown a consistent relationship between increasing television watching and poor dietary choices. In both the Nurses' Health Study and Health Professionals Follow-up Study, higher television exposure was cross-sectionally associated with diets higher in saturated fats, greater servings of red and processed meat, french fries, refined grain, snacks, sweets or desserts, and fewer servings of fish, fruit, vegetables, and whole grains [4, 7]. Neither of these cohort studies examined the relationships between television, physical activity, or diet prospectively. Increased risk for overweight or obesity associated with television watching has been examined in several cohort and cross-sectional studies [4, 6, 11–21]. Higher television watching was associated with higher body weight status or skinfolds in several studies including the United States, European, Australian and American Indian populations [6, 15, 16, 19–23]. 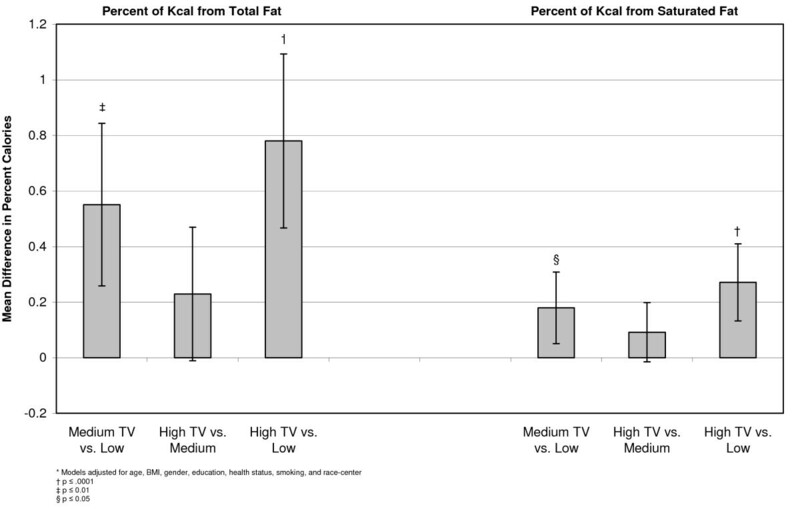 In the Nurses' Health Study and Health Professionals Follow-up Study, prospective analyses found an increased risk of obesity associated with higher television watching [4, 12–14]. This increased risk was independent of physical activity. However, none of the previous studies examined body weight status while considering all three behavioral risk factors, TV, physical activity, and diet. Since no studies have been published on the relationships between television, physical activity, diet, and body weight status in the same cohort, either cross-sectionally or prospectively, this study sought to explore the association of television watching with each risk factor using a cohort design. The Atherosclerosis Risk in Communities (ARIC) Study was designed to examine risk factors for cardiovascular disease and its related morbidity and mortality. Participants were selected from four US communities: Washington County, Maryland; northwest suburbs of Minneapolis, Minnesota; Jackson, Mississippi; and Forsyth County, North Carolina. A probability sample of men and women ages 45 to 64 years was recruited from each community, from which 15,792 adults completed the first clinic visit. The first clinic visit occurred between 1987 and 1989 and included a physical examination and an interview by trained personnel regarding medical history, health status, diet, and physical activity. Clinic visits were repeated at approximately three-year intervals. Further details on the ARIC cohort are available elsewhere [24, 25]. The Baecke physical activity questionnaire was designed to study habitual physical activity and distinguish between different dimensions of physical activity using semi-continuous indices of sport, leisure, and work activity . The questionnaire was interviewer administered at the baseline (1986–1989) and third clinic visit (1993–1995) of the ARIC study. The questionnaire included an item on television watching as part of the leisure activity index. This subjective question of television exposure asked: "During your leisure time do you watch television?" and allowed five responses: never, seldom, sometimes, often, and very often. The answers were ranked on an ordinal scale from 1 (low) to 5 (high). From this ordinal scale, television watching was collapsed into three exposure levels: low (never/seldom, n = 2878), medium (sometimes, n = 7293), and high (often/very often, n = 5403). Because television watching is a component question of the leisure index, the remaining three questions on leisure activity were analyzed separately. These items included information on walking and biking and were ordinally scaled from five responses (never, seldom, sometimes, often, and very often). The third question asked about minutes spent walking or biking to and from work or shopping and respondents could answer < 5 minutes/week, 5–<15 minutes/week, 15–<30 minutes/week, 30–<45 minutes/week, or ≥ 45 minutes/week. Sport and work physical activity were assessed with semi-continuous indices created from individual component questions and have been described in detail elsewhere [26–28]. Using the reported activities from the sport index, participants were also dichotomised as sufficiently or insufficiently active. Sufficient activity was defined as regular physical activity, or participation in at least one hour per week of activity for 10 or more months of the year [27, 28]. Insufficient activity was identified by less than one hour per week and/or less than 10 months per year. The reliability and validity of the Baecke questionnaire have been examined in both European and American populations. Test-retest reliability correlations of total physical activity from the three indices range from 0.65 to 0.93 [26, 29–31]. Validation of the Baecke has been conducted using physical activity diaries, maximum oxygen consumption, accelerometers, and doubly-labeled water [29, 30, 32–39]. In a doubly-labeled water study of three physical activity questionnaires, the Baecke had the highest agreement for total physical activity (Pearson's r = 0.69) . Usual dietary intake was collected at baseline and at the third clinic visit using a semi-quantitative, interviewer-administered food frequency questionnaire (FFQ). The ARIC FFQ contains 66-items and was based on the original Willett 61-item FFQ . The ARIC FFQ is organized into seven sections; 1) dairy, 2) fruit, 3) vegetables, 4) meats and fish, 5) sweets and baked goods, 6) miscellaneous, carbohydrates, fried foods, and 7) beverages. Interviewers asked participants; "In the last year how often, on average, did you consume ______?" Nine responses were available for each food item ranging from "almost never" to "more than 6 times per day". Each response was assigned a weight to estimate servings per day and daily intake of nutrients . Using the standard serving sizes from the FFQ, daily servings of each food item were calculated and summed to create food groups. Dietary outcomes were categorized into the following food groups: fruit, vegetables, fruit and vegetables combined, salty snacks, sweets, sweetened drinks . Total caloric intake, total fat and percent saturated fat, and estimated nutrient values were calculated at the Channing Laboratory, Harvard Medical School. The original Willett FFQ has been validated in a number of populations and is a well-recognized dietary tool with validity correlations between 0.35 and 0. 74 [41, 44, 45]. The reliability of the ARIC FFQ has been estimated among both white and African Americans participants in the ARIC study . Median reliability coefficients were 0.48 and 0.63 for White women and men, respectively, and 0.45 and 0.50 in African American women and men, respectively. Anthropometric measurements of weight and height were obtained during both clinic visits and were used to calculate body mass index (BMI) (weight in kilograms divided by height in meters squared). Four weight status groups were created using BMI: underweight (<18.5 kg/m2), normal weight (≥ 18.5–<25 kg/m2), overweight (≥ 25–<30 kg/m2), and obese (≥ 30 kg/m2) . At baseline, participants reported cigarette smoking (current, former, never) and years of education (<high school, high school, some college, or higher). Also at baseline, participants were asked to rank their general health as excellent, good, fair, or poor. Because one of the study centers was entirely African American (Jackson, MS) and others predominately white, a race-center variable to control for effects of race and center was created by combining each participant's race with their respective study center (e.g., Forsyth County African American; Forsyth County white). In order to examine the associations between television, physical activity, diet, and body weight status participants were excluded who did not answer the television question at baseline (n = 32) or were missing information on age, race, gender, body mass index, general health status, or smoking (n = 83). Additionally, in order to control for the effect of race and center, individuals other than white or African American and all non-white participants from Minneapolis and Washington were excluded (n = 103). Excluded from the prospective analysis were those individuals who died (n = 722) or did not return to the third clinic visit (n = 2,125), as well as those missing information on both physical activity and diet outcomes at the third clinic visit (n = 49). Final sample sizes were 15,574 for the cross-sectional analysis and 12,678 for the prospective analysis, the latter referred to as "the cohort". The associations of baseline television watching with baseline and six-year physical activity, diet, and body weight status were estimated from multivariable linear and logistic models. Analysis of variance (ANOVA) was used to estimate the mean of each outcome variable at each of the three levels of television exposure (low, medium, high). For the linear models, analyses were also performed using log transformations of all non-normally distributed outcomes. The results were unchanged using log-transformed variables and therefore, for ease of interpretation, they were left in their original state. For logistic models, outcomes were dichotomized as: having a BMI >= 25, being below the median for positive outcomes (e.g., physical activity), or above the median for negative outcomes (e.g., total energy intake). Low television exposure was defined as the referent and the odds of each outcome were estimated for medium and high television exposure. To assess the temporal association of baseline television watching with physical activity and diet over the six years of follow-up, the baseline value of each outcome was included in all prospective models for a further "baseline-adjusted" model. In a longitudinal analysis, adding the baseline outcome variable to the model will adjust for the cross-sectional associations at baseline between television and each outcome of interest. All statistical models included the following covariates measured at baseline: age, race-center, gender, BMI, education, smoking, and general health, with categorization indicated in Table 1. An a priori conceptual model based on a literature review and previous ARIC analyses helped direct model building with regard to confounder/covariate cut-points, television categories, and outcome categorizations. Post-hoc analyses were performed to assess if different outcome cut-points (median, vs. mean dichotomization; tertile vs. quartile categorization) resulted in different associations or conclusions. Analyses were also performed to assess any effect of outliers (defined as ≥ 3 standard deviations from the mean) and missing data. The statistical models, measures of effect, and 95% confidence intervals were computed using SAS V9.1 (Cary, NC; 2002). Selected baseline covariates* by television exposure from the analysis sample, n = 15,574. The analysis for this study was approved by the Public Health-Nursing IRB at the University of North Carolina at Chapel Hill, and participants provided written, informed consent at each ARIC center. At baseline, participants were predominately white (73%) and most (76%) reported completing at least a high school education (Table 1). While the majority of the sample (67%) was overweight or obese, approximately 80% reported "good" or "excellent" general health. Fewer than one-third of the participants were current smokers. More than one-third of the sample reported watching television "often" or "very often" (Table 2). The majority of the study population (>60%) was insufficiently active at both time points. In the prospective cohort (n = 12,678), the median number of servings of fruits and vegetables over the six years increased from 3.7 to 4.1 servings per day, while the servings of salty snacks, sweets and sweetened beverages remained relatively constant. Total energy intake and total fat both declined for the cohort, while sport activity increased slightly. Description of television watching, physical activity, and dietary outcomes at baseline and six years later. Participants who did not return for the third clinic visit (n = 2,125) or died (n = 722) during follow-up were more likely to watch television "often" or "very often" at baseline than individuals who remained in the study (42% vs. 33% respectively). They were also significantly (p < 0.001) more likely to have a lower sport index (2.31 vs. 2.46), work index (2.10 vs. 2.20), and consume fewer fruits (1.90 vs. 2.03 servings), salty snacks (0.35 vs. 0.41 servings), and more sweetened drinks (0.65 vs. 0.54 servings), at baseline than those who remained in the analysis. They were more likely to smoke (40% vs. 23%), report poor health status (8% vs. 2%), and have less than a high school education (39% vs. 20%). At baseline, watching television "often" or "very often" (high exposure) and "sometimes" (medium exposure) was associated with a 40% and 20% greater odds of being insufficiently active, respectively, compared to watching television "never" or "seldom" (low exposure) (Table 3). High television exposure was also associated with a 50% greater odds of being below the median of the sport index, but it was not associated with the work index. Participants with low television exposure had almost two-fold greater odds (1.96, 95% CI 1.78, 2.17) of walking during leisure time compared to those with medium television exposure. High television exposure was also associated with less walking and biking during leisure and for transportation. Increasing television exposure exhibited a graded relationship with unhealthy dietary choices (Table 3). 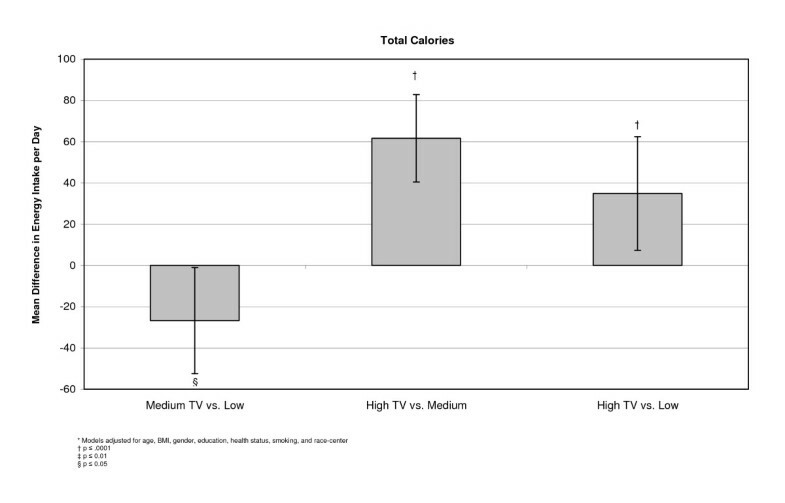 High television exposure was associated with an approximate 20 to 30% greater odds of being above the median for servings of salty snacks, sweets, and sweetened drinks, total fat, and percent of calories from fat and saturated fat, and below the median for fruit and vegetable servings. Odds ratios (OR) and 95% confidence intervals (CI) for the association of television exposure with physical activity and diet at baseline, n = 15,574. In a linear model, differences were examined between the adjusted means of each outcome at the three levels of exposure. These models indicated that individuals with higher television exposure participated in less sport physical activity than people who were exposed to medium or low amounts of television. There was no apparent relationship between television exposure and physical activity from the work index (Figure 1). Examining diet, we found that participants who reported high television exposure ate more servings per day of salty snacks (0.07, 95% CI 0.04, 0.09), sweets (0.16, 95% CI 0.10, 0.22), sweetened drinks (0.11, 95% CI 0.07, 0.15), percent of calories from fat (0.78, 95% CI 1.09, 0.47), and percent of calories from saturated fat (0.27, 95% CI 0.47, 0.13) than people who reported low television exposure (Figures 2, 3, 4). Those with high exposure also consumed almost one-half serving fewer fruits and vegetables per day (-0.41, 95% CI -0.52, -0.30) (Figure 2). 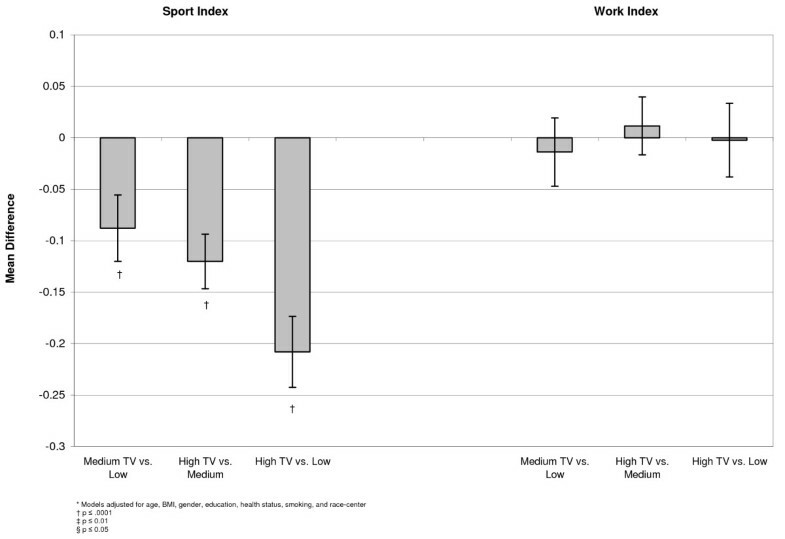 Adjusted* mean differences in physical activity by TV exposure, at baseline, n = (15,574). 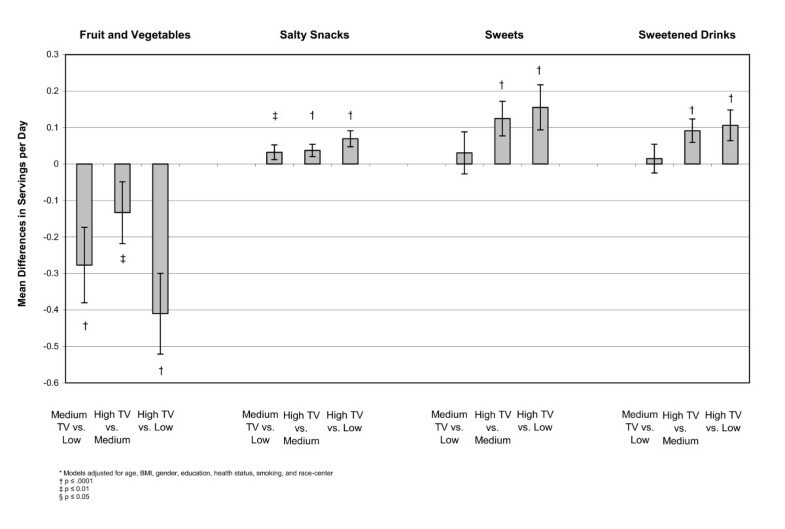 Adjusted* mean differences in fruit and vegetable, salty snack, sweets, and sweetened drink servings per day by TV exposure, at baseline, (n = 15,574). Adjusted* mean differences in total calories (kcal) by TV exposure, at baseline, (n = 15,574). Adjusted* mean differences in percent of calories from fat and saturated fat by TV exposure, at baseline, (n = 15,574). Similar relationships were observed between increasing television watching and body weight status. At baseline, participants with medium and high television exposure had a 22 and 43 percent greater odds of being overweight or obese than individuals with low exposure (Table 4). However the absolute magnitude of effect was less dramatic when comparing adjusted means in a linear model, and the only significant comparison was between low and high television exposure (Figure 5). Further adjustment for sport physical activity and total kilocalories had no appreciable affect on these results. 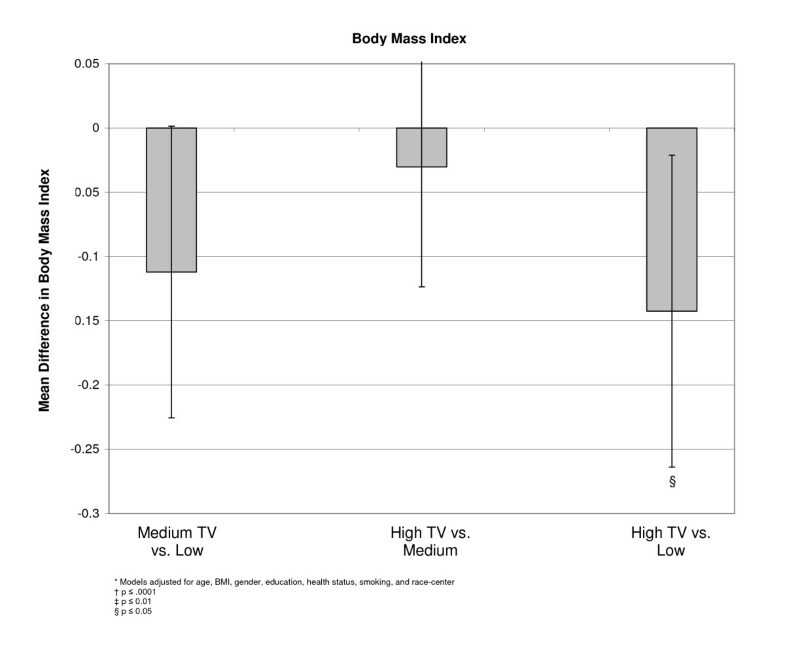 Adjusted* mean differences in body mass index by TV exposure, at baseline, (n = 15,574). Adjusted odds ratios (OR) and 95% confidence intervals (CI) for association of body weight status with television exposure, at baseline and at follow-up six-years later. Compared with low exposure, high and medium exposure to television remained a predictor of physical activity, diet, and body weight status over the six years of follow-up (Table 4, 5). Although the six-year associations were attenuated compared to the baseline associations, a consistent relationship was still observed between higher television exposure and more unhealthy physical activity and dietary outcomes. Adjusting for the baseline association of exposure and outcome in the models resulted in further attenuation of these associations, although a significant effect was observed for most physical activity and dietary outcomes. Adjusted* odds ratios (OR) and 95% confidence intervals (CI) for association of baseline television exposure with physical activity and diet six years later, n = 12,678. * All models adjusted for baseline values of age, BMI, gender, education, health status, smoking, and race-center coded as indicator variables. † Baseline-adjusted models include the baseline value of the outcome variable. # Often, very often (high) vs. never, seldom, sometimes (low). The associations between television watching and body weight status were almost the same for both medium and high television exposures in the prospective model (Table 4). However, both exposure levels were still associated with greater odds of being overweight or obese at six-years follow-up relative to low exposure. Additionally, when the baseline term for body weight status was added, the prospective association attenuated to the null. Post-hoc exploratory analyses were conducted to examine the effect of different cut-points and model choices. Regardless of the model choice (linear versus logistic model), consistent associations were observed between television and each outcome using different exposure and outcome categorizations (continuous, tertile, quartile, different dichotomization). Even when outliers were removed, the conclusions were the same (data not shown). Lastly, we also restricted the sample to only participants with complete data however the conclusions were again the same (data not shown). At baseline, graded relationships were observed between television exposure, level of physical activity, diet, and body weight status. Similar relationships for physical activity and diet were still apparent in prospective analyses, although attenuated after controlling for the baseline association between television and each outcome. A different pattern was observed with television watching and body weight status, where including baseline outcome in the model eliminated any prospective effect. Adjusting for baseline in the prospective models helps us examine the temporal sequence between exposure and outcome over the six years. These adjusted models suggest that television is perhaps associated with negative behavioral choices over time. These results also provide some evidence in support of the 'displacement hypothesis', which holds that sedentary activities, such as television watching, are substituted for more active pursuits. Because many adults have only a few hours daily for discretionary activities [1, 2, 48], watching television during free time may displace exercise or physically active leisure pursuits. An inverse association was observed between television exposure and each type of physical activity (i.e., sport, work, leisure walking, or leisure biking). If high exposure to television encourages people to expend less energy in other aspects of their daily lives, then the chances of these individuals meeting the recommended guidelines for physical activity are reduced. Although the magnitude of the observed associations between television and diet appear small, the impact on the population could be significant. Results from the cross-sectional multivariable linear models indicated that adults with high television exposure consumed approximately one-half serving of fruits and vegetables less per day than those with low exposure and had higher energy intake and fat intake (data not shown). If these differences occur daily, with no additional dietary changes, they would project to a yearly burden of thousands of additional calories and hundreds of grams of fat. Previous literature has shown that television may impact risk of chronic disease, independent of physical activity [4, 7, 13]. The Health Professionals Follow-up and Nurses' Health studies have identified significant associations between television watching and biomarkers for cardiovascular disease, such as low density lipoprotein, high density lipoprotein, leptin, as well as higher risk of becoming overweight and developing type 2 diabetes [4, 12–14]. Television watching in this study was also significantly association with overweight and obesity. Similar to previous studies, this association appeared to be independent of physical activity and diet. The results from this study also suggest that television watching may influence other chronic disease risk factors such as diet and physical activity. It has become increasingly apparent that sedentary behaviors (such as television watching) may play an important role in physiology, health outcomes, and even gene expression [4, 12, 13, 49–51]. This study is the first large cohort analysis to examine the associations of reported television exposure with physical activity, diet, and body weight status. However, it is important to recognize that the question measuring television exposure was subjective and semi-quantitative, and could result in misclassification. Additionally, although the Baecke questionnaire has shown validity and reliability in other populations [29, 39, 40] the television question used in this analysis has not been validated as a single item, to our knowledge. Although better measurement tools have been developed and great strides have been made in physical activity epidemiology,  no tool has been designed to adequately measure sedentary behaviors . The television question in the ARIC study is also not an absolute measure of time, and is a subjective measure of exposure. To minimize this limitation, ancillary data was obtained (M. Hulens, personal communication, 2004 ) which compared the Baecke television question with a second, concurrent report of the continuous number of hours of television exposure in a Belgian population. Agreement between continuous hours of television and the single item Baecke was acceptable (chi square 92.3, p < 0.0001). Food frequency questionnaires like the ARIC-FFQ collect information on a limited number of food items and do not assess total energy intake; therefore, these dietary outcomes contain measurement error. Yet until better methods are developed, FFQs are a practical method for gathering information on dietary behaviors in large cohort studies . Although validation of the ARIC FFQ is not available, the Willet FFQ, on which the ARIC questionnaire is based, has been validated and used in other well-recognized cohort studies [41, 55, 56]. Reliability of this tool has been shown to be between 0.45 – 0.63 across visits (3 years) in this study population . Future studies could consider exploring measures of diet quality, in addition to the components that we assessed. Another limitation of this study is the loss of participants between visits. These individuals (n = 2,847) were less healthy, reported higher television exposure, and had more negative diet and physical activity patterns than those who remained in the study. Because these individuals fall into both the high exposure and more unhealthy outcome categories at baseline, it is unlikely that the results would be different had these participants remained in the study. This study is observational and relies on recall of both exposure and outcomes. Therefore, in a study of this nature it is impossible to untangle any effect of previous television, activity, and dietary behaviors from our observations. Additionally, baseline data collection began in the mid-eighties and societal television, physical activity, and diet behaviors will not be the same as present day. It is important to recognize that the generalizability of this study to current sedentary behaviors and other populations is limited. Additionally, physical activity and diet are arguably mediators on the pathway between television exposure and overweight or obesity. For example, physical activity has been previously found to be an effect modifier of the association between television and obesity . A fundamental principle of adjusting for a confounder is that the covariate is not an effect modifier or mediator of the relationship between exposure and outcome. Therefore, in our example adjusting for a mediator (e.g., physical activity) like a confounder may not result in the best estimate of the association . Lastly, although an attempt was made to establish temporality, true cause and effect cannot be ascertained from this study design. The results from this analysis suggest that television exposure is associated with deleterious effects on physical activity, diet, and body weight status in adult participants of the ARIC cohort. Television exposure was associated cross-sectionally and prospectively with physical activity, diet and body weight. Consistent associations were observed in all analyses between higher television exposure and more unhealthy physical activity and dietary behaviors, but not body weight status. Adjusting for the baseline relationships attenuated, but did not eliminate, the prospective associations between physical activity and diet. These results support the hypothesis that television may be a substitute for time spent in more physically active pursuits and may contribute to both immediate and future dietary behaviors. Television may also play a significant role in body weight status and the burgeoning obesity epidemic. It is important for adults to recognize the amount of time spent in front of the television being sedentary may contribute to unhealthy lifestyles. Future research can help identify the behavioural correlates (e.g., physical activity, diet) of sedentary activity, and understand the combined impact on chronic disease. This work was supported in part by the National Heart, Lung, and Blood Institute #5-T32-HL007055. The authors would like to thank Dr. Kimberly Truesdale and Dr. Diane Catellier for their valuable feedback. We are also indebted to Dr. Maria Hulens for sharing her ancillary data on television watching. The Atherosclerosis Risk in Communities Study is carried out as a collaborative study supported by National Heart, Lung, and Blood Institute contracts N01-HC-55015, N01-HC-55016, N01-HC-55018, N01-HC-55019, N01-HC-55020, N01-HC-55021, and N01-HC-55022. The authors thank the staff and participants of the ARIC study for their important contributions. AMM and KRE developed the hypotheses. AMM carried out the literature review, statistical analysis, and drafted the manuscript. DC provided statistical consultation. GH and JS participated in the study design and collection of the ARIC data. AMM, KRE, MP, and JS provided contextual and epidemiologic expertise. All authors were involved in critical revisions of the manuscript and have read and approved the final manuscript.